9781891788833 - Libro de Arte Coquinaria by Maestro Martino. Rome: n.p. (Oakland: Octavo), ca. 1465; 2005. 1st edition. Other Binding. New/No Jacket (as issued). 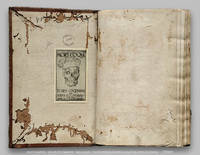 New digital facsimile (in electronic PDF format on CD-ROM disc) of a rare manuscript of what is undoubtedly one of the most important surviving cookery books of the Renaissance, from the Katherine Golden Bitting Collection at the Library of Congress. This Octavo Edition contains detailed digital images (may be magnified at up to 400% of original size) as well as a foreword by Alice Waters of Chez Panisse, essays by Bruno Laurioux and Paul Shaw, and an English translation and introduction by Gillian Riley.